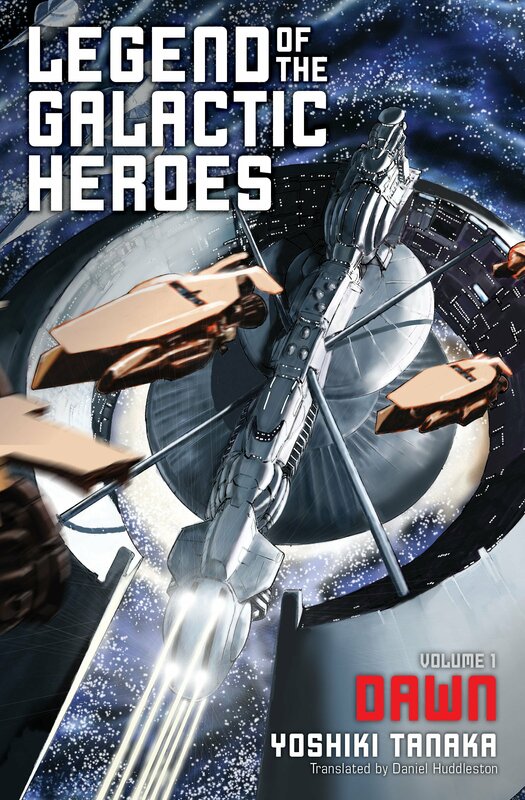 This review is for the first volume of Legend of the Galactic Heroes by Yoshiki Tanaka. The English edition was released by Viz Media’s Haikasoru imprint in March 2016. The second volume will release this summer, and will by followed by the third in the autumn. There were ten volumes in all in Japan, released from 1982 to 1987. When I think of Legend of the Galactic Heroes, the phrase that comes to mind is “cult classic.” Before this year, the only way English-speakers outside of Japan could really experience this space opera epic was through its anime adaptation–and more specifically, through fansubs of it. (The anime was announced for official localization by Sentai Filmworks just last year, incidentally–no release date yet though.) This anime was a huge hit for those who watched its 110 OVA episodes, and to this day it continues to be one of the top ten highest-rated anime on MyAnimeList (along with about a half-dozen versions of Gintama). At any rate, I never saw the anime myself–but when the license for the novels was announced I told myself I’d give the first volume a read once it came out. The story’s two main characters–the ones making the big decisions Tanaka alluded to–are Reinhard von Lohengramm and Yang Wen Li. The two serve to show both sides of the war that ensues between the two interstellar nations, and the contrast between them extends to their personalities and motivations. The determined Reinhard is a lesser noble in the Galactic Empire who quickly climbs the ranks of the military thanks to his genius and his personal ambitions of freeing his sister, overthrowing the corrupt oligarchy, and ultimately reuniting the galaxy under his rule. Meanwhile the laid-back historian Yang would much rather stay out of the spotlight entirely, but through a series of events he finds himself the lead strategist of the Free Planets Alliance Star Fleet thanks to his knowledge of military tactics throughout the ages, and thanks to his willingness to use “sneaky” tactics that his prideful superiors and enemies repeatedly spurn. Both nations are interestingly portrayed in a rather negative light, and in turn both Reinhard and Yang have their obvious flaws. The story for volume one is rather straightforward, and much of it is expository in nature–again, feeling a bit like a history text. As such, the prose in general can come off as stiff or dry to some readers. I found it acceptable overall, but I think it helps if readers keep in mind this book was written in the 80s, and it is a translation from the relatively formal Japanese. In my case, it probably also helped that I experienced this story through its audiobook. If you are interested in audiobooks at all, I highly suggest that route for Legend of the Galactic Heroes. The narrator, Tim Gerard Reynolds, gives a dramatic and theatrical performance that fits the narrative perfectly. I found it lots of fun to hear how the various space battles would unfold that way. Fans of military sci-fi won’t want to miss this series, though I wouldn’t be surprised if most of you already picked up this introductory volume right when it released. For everyone else, I suggest giving it a try if you are in the mood for something grand in scope, rather than more character-driven fare. It should be noted for reader (because ViZ didn’t do it) that Haikasoru decided to “update” or “modernize” the book. Where Julian was reading republished PAPER books in the original, now he’s reading ebooks. In some of the fight scenes they decided that pushing buttons wasn’t tech enough and added “on their touch screens” to the story. I really hate modernizing a story because it really feels like I’m being treated like a little kid when they add cell phones to Nancy Drew and Hardy Boys books. I assume this is aimed at an adult audience that can understand the books was written in the 80s. Past a few things like that marring the book, Haikasoru didn’t do a bad job on it. Very interesting to hear! I was not aware of these changes. I can see the reasoning behind them, and understand the argument against them — I personally don’t find it a big deal either way in this case though. Well, so long as the author is okay with it, why not? It’s their work to do with. I do find the buttons>touchscreen odd. Honestly, buttons have more reliability/endurance than touchscreens AND better user confirmation (your fingers felt that they depressed something). A detail-oriented writer like Tanaka should know this… so why?